Awesome. We only stayed a night on our way to Phuket but we thought it was great. Easily accessible from the airport via train and taxi. Staff sent us to a great little place for dinner. The hostel was clean and very well furnished. Won't hesitate to stay on our way back through. I absolutely loved my stay at this quaint little hostel. It’s beautifully decorated with chandeliers. The room and facilities were squeaky clean. The staff members are so sweet and welcoming. They really make you feel like you are guests in their home. It’s not in the most tourist friendly location but there are really nice bars nearby and the staff is able to tell you all the easy ways to get to the places you need to go. Couldn’t recommend this place enough! The location is nice and quiet, but you have to make use of the #7 bus and the micro truck. In the day time the wait is never more then 10 minutes. 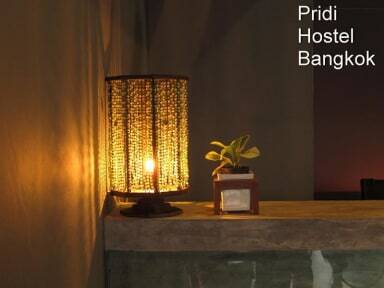 I loved my stay at Pridi! The staff is what makes this place - the brother/sister pair at reception were friendly and helpful and quick to make suggestions and offer directions. Place was clean and well kept. Very quiet and low key atmosphere, which is exactly what I wanted. A little far out from the main locations, but accessible to cheap transportation. Will stay again. 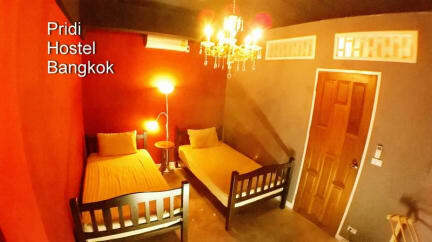 What an excellent boutique Hostel! Yes, it's quite far from the tourist areas but it's near the BTS. But the location should not be an issue if you like to see a different part of the city. Basic breakfast but good enough. Very clean rooms. It's family owned so expect the extra care. Highly recommended! Ms. Nalin was very helpful! Awesome place, super awesome staff. Highly recommended. The bonus is that there is a kitten to play around. Pridi hostel was a comfortable stay. My boyfriend and I had a private room with two twin sized beds. The room was small but had enough space for chairs and a little table which was nice. Beds were comfortable and all the facilities were really clean. The staff was so hopeful telling us about what was happening around the city. Breakfast was simple but good. We really enjoyed enjoy it although it was a bit far from the center. If you are looking for a quiet place to stay then you will like it. Main point that bothers me is that it is not near a BTS station or nice restaurants. It is in the suburbs and not close to Bangkok City centre. Travel to and from scenic places as well as city centre a bit of an inconvenience. Pridi was the perfect hostel to relax and store your things but if you're looking for a social hostel you might want to look elsewhere. This hostel was close to the BKK airport but not as close to any of the main areas like Khao San Road or temples (but taxis are cheap!). The hostel was very clean but there's only 2 showers for all guests to share which was a bit of an inconvenience. While you can only expect toast and fruit for breakfast, the staff definitely makes you a priority at any hour.